Have you ever had a feeling a book was going to be good just from the title? You know, pardon the pun, sort of a hunch that the content of the book was what you needed to read? Right now, at the perfect time? 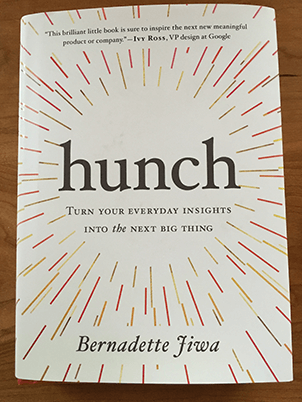 Hunch by Bernadette Jiwa is that way for me. I first heard about it from the daily blog post I receive from Seth Godin and was intrigued by the title because I believe in hunches. I ordered the book from Amazon using my trusty Amazon App with a Prime membership so it was easy and fast. Delivered two days later, in fact. This section of the book is about mindset, creativity, believing in yourself and trusting your intuition. In one chapter, Jiwa writes about the ability to ask questions and how this relates to insights. I’ve written before about the power of thinking and controlling one’s mindset in a post called, “What Drives People to Change?”. Ms. Jiwa writes in her book, a nice story about her mom, a childhood illness and how people treat us influences beliefs later in life. Part three is my favorite part of the book because it’s about curiosity, interaction, follow-up, and endless possibilities. As a person in the medical device business, I enjoyed the story of Telephone Triage she shares about her father’s medical practice. In closing, Bernadette uses a “Prompt-Action-Insight” formula to build an actionable framework we can all use to turn this little book into a powerful resource. After you read the book, please leave a comment about what you most enjoyed while you were reading Hunch. When do you do your annual goal planning?